It was a wonderful time to having Snow Art like today!! 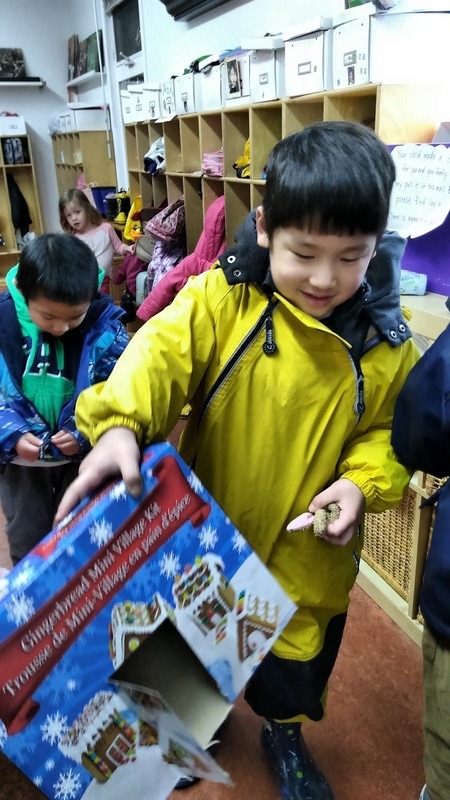 Each children got a snow canvas. 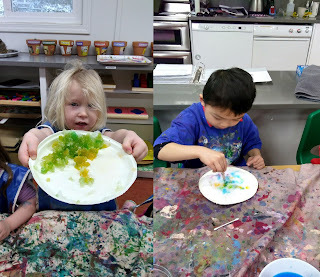 And the children started to make own snow art. 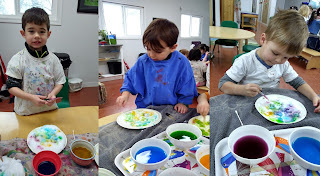 This art is exploring of mixing colour on the snow canvas (plate of snow) . They built their hand strength and coordination like squeezing the rubber pippet to squirt colour onto the snow. They tried to change finger strength to explore how much the water could bring into the pippet. We are learning about generosity and sharing. Each table has limited cups that coloured water. "Can I have blue colour ? We heard some sweet conversations between children.
" Naomi ! It's like coloured water is eating snow! " They noticed melting is not only caused by ambient temperature but that coloured water also made snow melt. The children all enjoyed themselves until the snow half melted. Feb.16th is Chinese New Year. Some children know this special day. 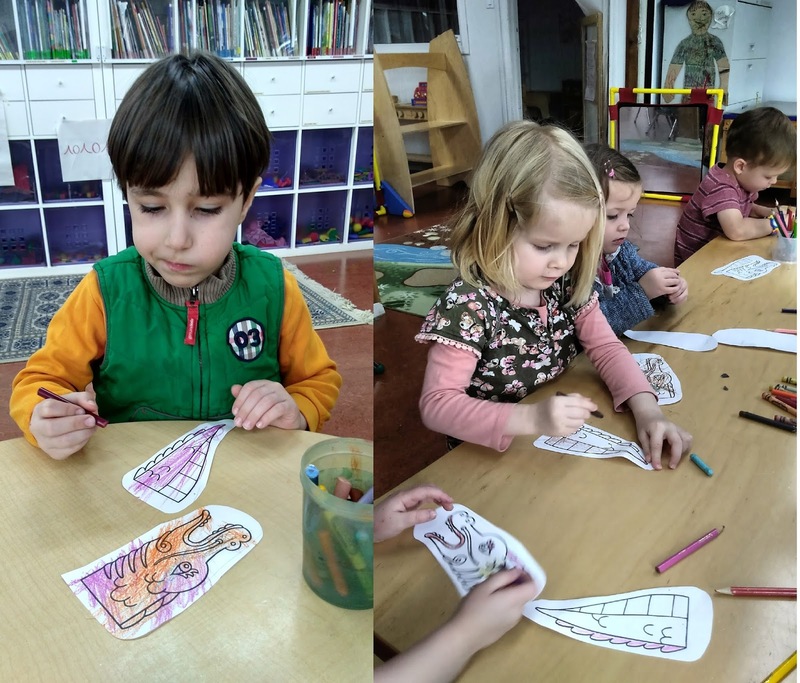 Today's art, we made Puppet Dragons. 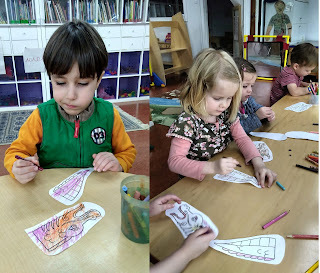 The children coloured a dragon's head and tail with crayons and coloured pencils. 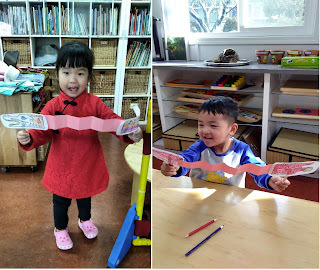 Each children picked a favorite colour of constraction paper for the body. and then folded an accordion patterm of back and forth movement. 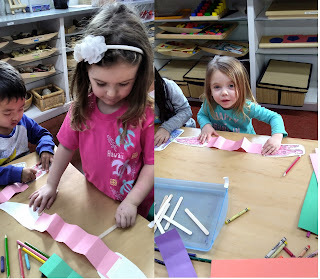 Learing about patterns is an important step in math understanding. The children felt prout of their folding. They connected the head with the body and tail. And added two popcicle sticks to hold. They all loved this lesson and the art and discussion was invigorating. 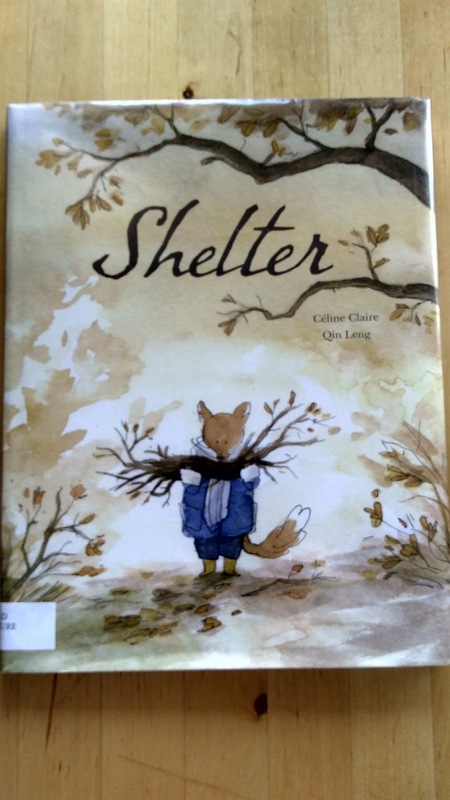 In two weeks, The Maple group (on Tuesday) has been reading a book called "Shelter " by Celine Claire. In the story, As a big storm approaches, two strangers (bears) arrive in the forest. All the animal families, safe in their homes, are worried. 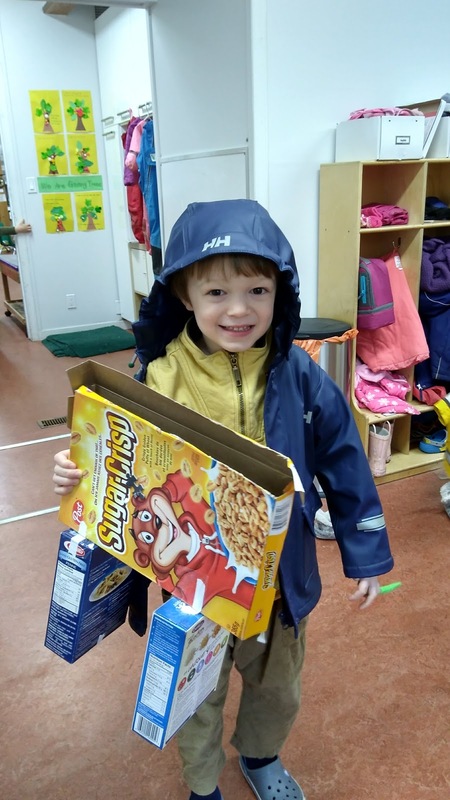 The two bears knocks on each door and ask for shelter. but no one will let them in. After reading this story, we were wondering why all the animals couldn't help them? They are afraid the strangers. Their house are too small. 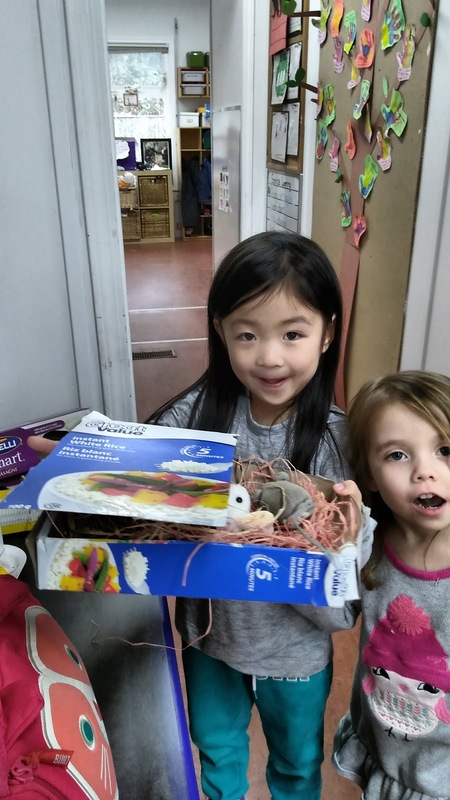 To play with the idea of "shelter" and to practice the act of welcoming we made own shelter. 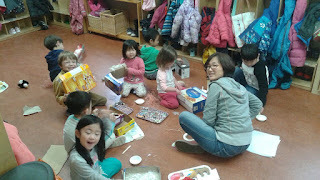 Each child picked an animal puppet, and got a box and began making a shelter. My snake house. it's a cool tree house. the door is on the top. Look! My shelter has a big door! with a mouse, because my shelter is big.